Tiger Salamanders to me are strange looking amphibians. They have eyes that seem to pop put of their head, and a large grinning smile. Brightly coloured with black and yellow marks, makes them very attractive. What does the Barred Tiger Salamander look like? This species of Salamander grows to an adult size of approx. 300mm (12 inches) from head to tip of tail. The tail can sometime be the same length or longer than the body. They have a dark black base colour with bright yellow bands and blotches over the whole body and legs. As you look at them, it seems like they always have a grin on their face and I don't think their eyes can pop out any further! I think their faces are amazing, so strange looking! 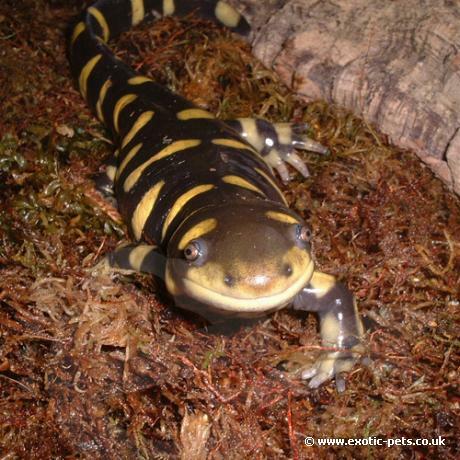 Where are Barred Tiger Salamanders from? Found in parts of America. Room temperature of 18-23C (65-75F) is ideal for this specie, 23C (75F) being the maximum temperature in summer as they do not like it too hot. You can drop the temperature right down to 5-10C (41-50F) during the winter if you are wanting to breed with them, mating follows hibernation. The Salamanders need to be kept on moist moss, but always allow a slightly drier area so they can regulate their moisture levels. Spray approx. 2-3 times each week with treated water, only lightly mist as you don't want it too wet. Are Barred Tiger Salamanders easy to keep? Yes, with the correct set- up. You can use either a glass or plastic tank (the later is cheaper), but this need to be a minimum of 24 inches long to house one Salamander. Due to them being a burrowing species, provide a soil substrate of 4-6 inches deep. Place moss over 3/4 of the soil and leave one end free from moss and keep this slightly drier. At the other end of the tank, place a large, but shallow water dish - tip: use a cat litter tray. You may find that the some Salamanders use this as a toilet, so easy access is a must for cleaning out daily. Finally, you need some hiding places such as cork bark, flower pots etc. Feed a range of live insects; crickets, locusts, mealworms, flies and earth worms to vary their diet. As a treat feed them wax worms and baby mice (pinkies), not too many as they are high in fat. You want to be feeding your Salamander approx. 2-3 times each week. Don't over feed them, as they will become obese in captivity! Caution: When providing water for your salamanders, this MUST be treated with an Aquarium de-chlorinated solution. The Chlorine will harm and possible kill your salamanders after a period of time. Alternatively, you can use fresh, clean rainwater!